You will earn 4,475 Reward Points. Earn 1 reward point for every 1 dollar spent. NAFEM Data Protocol: The C5 controller is NDP capable. ENERGY STAR: Full Height, 3 /4 Height, and 1 /2 Height Stainless Steel reach-in models with solid doors are ENERGY STAR rated. Control: The intuitive 8 Series solid state controller provides continuous closed loop monitoring of temperature providing accurate control over the internal environment of the cabinet, resulting in safe and hot food. Actual temperature is measured, displayed, and controlled. Performance: Rapid heat-up and recovery times are achieved with a digitally controlled ducted heating system. The intelligent controller assures food is held at the desired temperature. 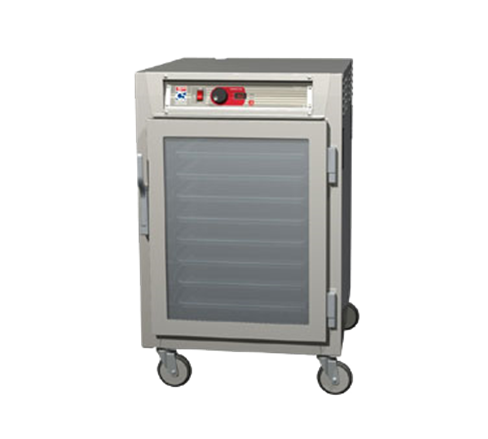 Low temperature alarm assures cabinet is performing within desired temperature range. Display and Controls: Intelligent cabinet temperature control with digital display. Universal Slides: Universal wire slides; 1/4" diameter nickelchrome wire adjustable on 1 1/2" increments. Type 304, stainless steel vertical standards.